5.25" round mirror on 3.75" fixed arm (RPO 210 for 1961-2, RPO D32 for 1963-5). This mirror was available for left side only or both sides. 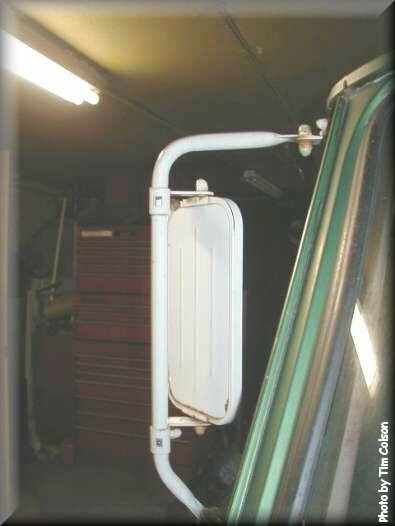 Beginning in 1963, this mirror was not to be installed on Corvans due to the limited rear visibility of the panel vans (especially since windows in the rear doors became extra cost in 1963 for Corvans). 7.5" x 10.5" or 6" x 11" rectangular mirror (first size was available 1961-3 in black as dealer-installed only; second size was available 1963-5 in white as 985410 in 1963 and 985771 in 1964-5 from the dealer and RPO D29 from from the factory). This "West Coast" style mirror was available for left side only or both sides. Thanks to Larry Claypool for the above information, originally published in the April, 1989 "Stock Is..." column in the CORSA Communique. FC owners' options weren't limited to Chevy-produced mirrors. 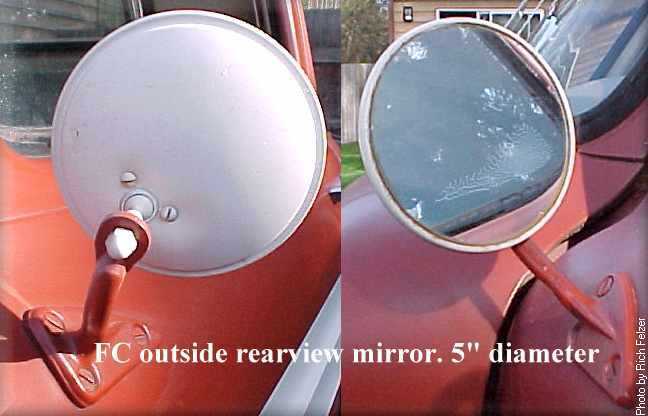 One common aftermarket mirror was made by the Coronado Manufacturing company of Long Beach, CA. Their mirror was by default a "West coast" style (given the company's location) and it does look similar to the Chevy mirror of the same type. Below are images of a flyer the produced on the mirror for 1961. The flyer was printed as an 8" x 10" photo. 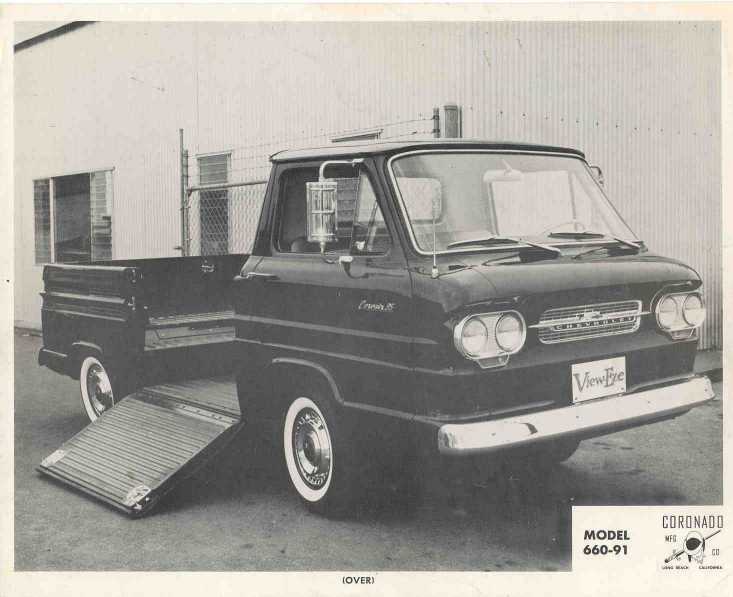 The largest difference between the Chevy and Coronado mirrors is that the Coronado mirror is chrome-plated. The Chevy mirrors were always painted white or black, even on "deluxe" vehicles. 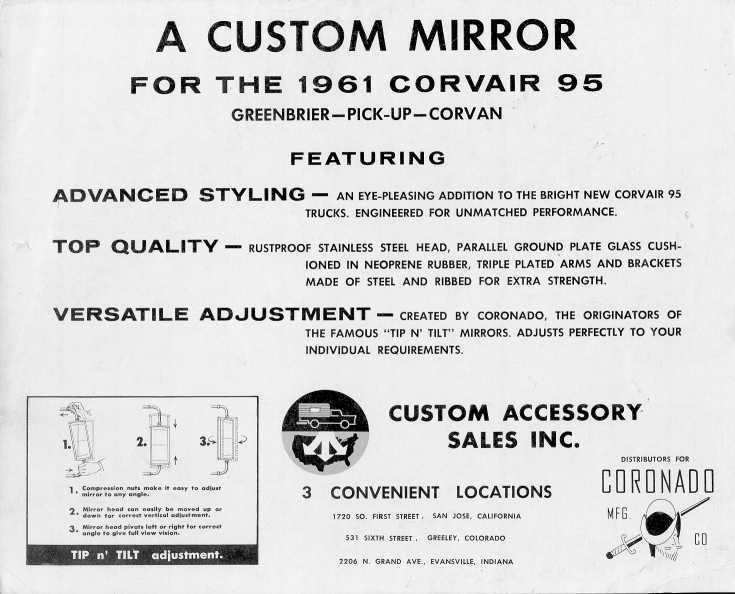 Also, the Coronado mirror's back was quite curved while the Chevy mirror was flat.